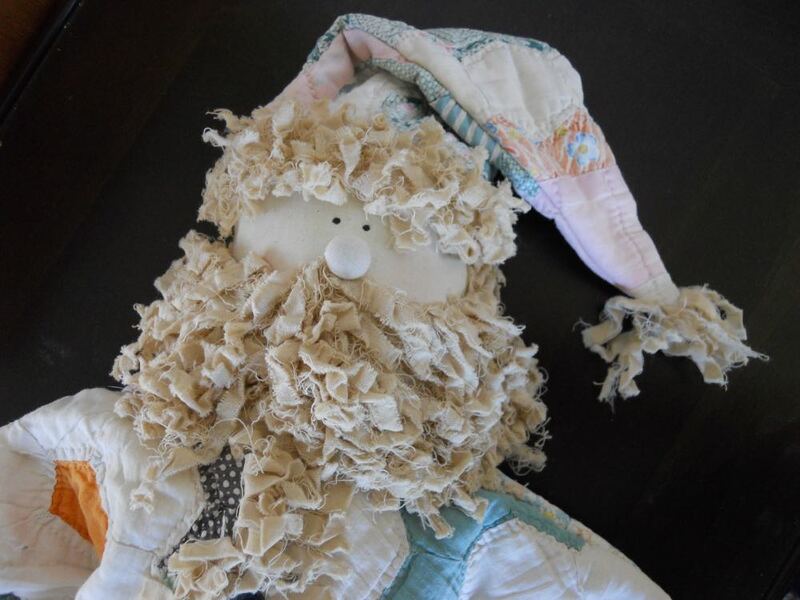 An old flower garden quilt was made into Santa's long suit in this unique one of a kind Santa doll. Sometimes one has that one quilt that is just so special but so ragged it just can't be used as bedding but you don't want to give it away or discard it. That's the story behind these Santa dolls made from old quilts like this Flower Garden Cutter quilt santa doll. Santa's face is made out of brand new cotton muslin with a muslin beard, as are his arms and legs. His hat and gown are made out of a salvaged old Flower Garden patchwork quilt that was falling apart so the good parts were salvaged. The nose is a wood dowel covered in fabric, which doesn't sound very charming but it is once you see it finished and on the doll face. This Santa is ready to sit on a mantle or under a Christmas tree! Since these are made from old quilt remnants, each Santa doll is unique. Customers who have purchased these Santa dolls have said these are "nicer than they expected them to be." Much better than being naughtier, don't you think?